My bag is based on an bag in the British Library collection dated 1639, Shelfmark c25m17, found at Museum Website #1 listed below. 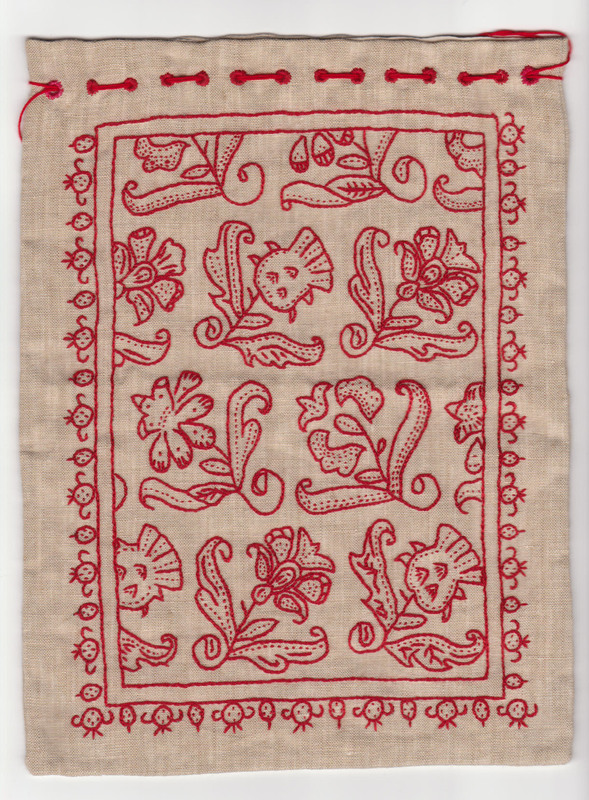 In the seventeenth century, embroidered linen bags were often found with bibles. The bibles were stored in bags to protect them from wear and tear since the bindings covering the bible were embroidered as well. I have listed my embroidered bag as a “study” rather than a reproduction because it is based on guess work. The British Library website does not list the materials used in the original bag. In addition, the museum photograph is quite blurry. I undertook this project on the spur of the moment because I wanted some fun embroidery work to do on vacation. Since I did not have this information before I made my bag, I used guess work. – Two-strand silk done in split-stitch. It’s amazing what one learns during the execution of a project like this. When I made the design from the drawing, I drew the flowers and their details from the source photograph without thinking much about the execution. During the embroidery process, I determined that I hadn’t been consistent with my flower drawings. Sometimes the leaves had veins, sometimes they didn’t. Sometimes a flower had spots, sometimes it didn’t. I don’t know if these imperfections are due to the original maker’s embroidery, a degradation of the original bag’s materials or simply a blurry photograph. In addition, I think that sometimes we in the SCA are too perfect in our reproductions. We do not take into account that the object we are reproducing is less than perfect, itself. A higher resolution photograph will show the reason for the imperfections in design. She took some photos for me but of course I can’t publish them. It’s been awhile since I looked at the material. I’ll see what she sent me and get back to you tomorrow. Thanks for your quick response. I am at the start of a project which involves looking at early (pre 19th century) embroideries worked in red only threads -long way to go.yet.